Was wondering, are the feet also geografted? its kind of listed like it is, but not actually said. Also , for the geografted items..... well. As much as I love geograpting, it makes its use with other things limited. 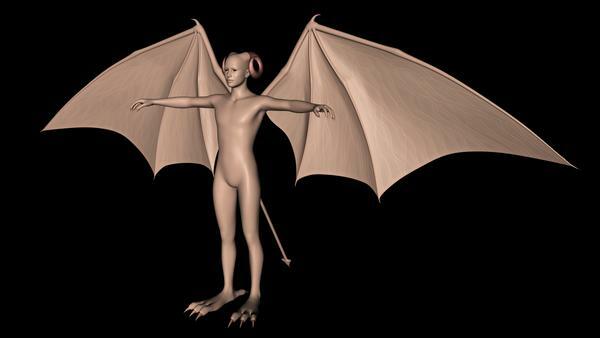 For example if I want a human demoness, and put a human skin on her, and the wings, wouldn't the wings have a square or circular patch where it replaces the skin on the back? With a conforming figure, that connection could have transparency to blend into the skin but I don't see how that's possible with the geografting. So, I thinkt hat means you can only use this set with the supplied textures? Can anyone show me how it looks when genesis has a human texture and the geografted items are not? thanks very much :D I have much needed demon wings and tail and horns, this is hopefully what I need!!! and cute bunny girls too eek must not look! yes, all add-ons geografted, so textures would really need to be customised. I suppose there's a couple of ways to approach using a human colourscheme, and it'll depend how "real" you want the skin to look. * do a complete texture set from scratch. * re-colour one of the provided texture sets usinf image editing software. Bother, see, this is the draw back and why geografting isn't good. I ran into this problem with Rawart's Gorgon. Being used to conforming clothing, i thought the tail was something I could use with genesis, and genesis using any skin texture. Nope. Can ONLY use the ONE texture it comes with. Banging my head on a wall about that, because I bought it to JUST use the taiil and my own textures, and I can't use it that way. A purchase that i can't use. Nothing wrong with that, but I do think that vendors need to say on the sale page something about this new limitation. And yes, it's a limitation. With a conforming item you can use the wings and genesis in combination with any genesis texture. TONS of options. I appreciate the several options in this set, but I'm frustrated that I can't use the textures i already have. Its a drawback to geografting and glad I asked, because i would have cried not being able to use it with my own textures. Unless I combined and doctored them. perhaps future versions can have texture layer with LIE, that would allow the user to merge the textures over their own human skins?? I have had the exact same problems as you, with both Popobawa and the Gorgon. It's not the merchants' fault (as you said, it's because of geografting), but I also wish that these sorts of things would be mentioned in the product's description. I think I have three recent purchases that I may not be able to use because I cannot customize them as I need to. I won't return them because they're not faulty or of low quality, but I'm getting more reluctant to make purchases, on sale or not, unless I learn more about the item. Exactly, the quality is there, they're lovely, but we are ALL used to conforming items that let us mix and match. I rather wonder if I can take gorgon tail, and change it to a conforming item and make transparency on it, then it won't be sitting unused in my runtime. But that is a freaking lot of work, and at the point I might as well use the morphing python or something. Sigh. I'd also hoped that the Gorgon would have separate mat zones for skin and scales, with the skin able to take any torso texture. As is, it's much less useful than I'd expected. I love the concept & quality of geo-grafting but I usually prefer conformers for the versatility as well. I'd rather have more options and have to deal with fixing the minor gaps or issues that may occur. The entire reason I love genesis so much is for the versatility. I like the characters I create to feel like my own creations not cookie cutter templates. We can do a lot of work editing materials but at that point I might prefer to just make the entire item from scratch. It's a shame there is not a better solution. I don't like asking for refunds either but I would not feel bad if the product does not work as you expected it to and if your not going to use it. If I was a merchant I would much rather have a customer get a refund for a product then not be happy and hesitate to purchase more in the future. They should add a warning for any characters that don't work with other skins. There's something else that potential buyers of Popobawa should know: the wings and the wing bones share the same material zone. This isn't a problem if you want both the wings and the bones that support them to be the same color and opacity, but if you wanted them different colors or to use different surface settings...yeah. Thanks for the information. I was considering buying this. At least there's the polygon group editor, I suppose you could color the wing bones and make it a new mat file. But I agree. I wish I could swap the gorgon for a different character. I hate being so limited. I love the way genesis can do SO SO much but but geografting in some ways is step backwards. some things I truly love, i love deep aquatic genesis, but that has its own limitations- such as not being able to select which parts to use or not use (because the texture is onlly on the geografted figure, not on all of genesis, so without the geografted hands/feet/fin there are large white spots on Genesis in those areas. Stilll love it, just as I think Gorgon is pretty cool, and Popobawa and catgirl and bunny girl and elephant man and all are super cool. Just saying that its highly limited in what it can be used for, and therefore vendors should know know they are less useful that way. I do think its important to start telling customers about things like that. Many times we buy soemthing saying, "ooh, i want to use this texture, but on a different product" or "oh i want to use this tail, and that one's wings" which was all completely possible and widely known customization when items were conforming. Now that its geografted people loose that ability and are very likely to get frustrated. now wouldn't it be neat if items had an either or option? to conform it OR geograft it? and came with transparency textures? I know that's probably not an option, but wish it was, because in some ways the geografting is a step backwards for Genesis versatility. I don't know how much extra work it would be to produce both geo-grafted and conforming versions but I would love that. I will eventually find out as I'm trying to learn all that stuff. I came up with a possible work around to use any skin texture with the Gorgon tail. I just render the scene two times, one with the tail attached and 1 with it not attached. Then composite the two renders in an image editor. You can even try to feather the transition or cut around the scales for a different look. This might not work for everyone or be the best solution but I think it will work for my needs in many cases. Although I would not want to have to do 2 renders if I use Reality/LUX! Severed Man seems to work really well on anything from my tests so far. I was a bit disappointed with Cyclops that one seems really limited for shapes and textures. 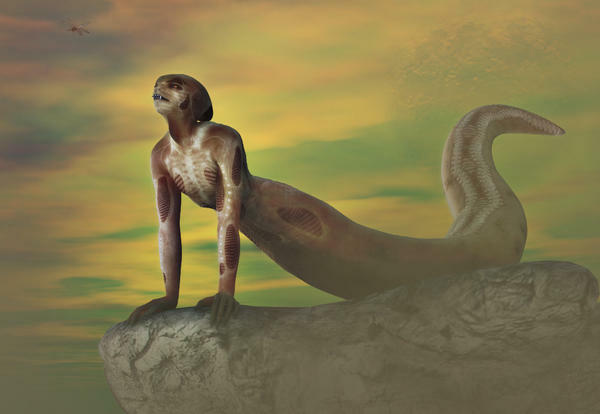 I didn't find it particularly difficult to retexture the Gorgon tail to match other textures. Sadly I lack your painting ability. Turning a GeoGraft into a plain conformer should just be a question of deleting the groups - the autohide on Genesis and the graft group on the item itself - and saving as a new Figure Asset I think, but I haven't tried this. Then you'd of course need to hide bits of Genesis and apply a fade-out transmap to the former graft to blend it with the skin. and the whole thing goes - be careful not to include too many or too few brackets. I would still say load the item, then save it as an asset and work on that so that you still have the original GeoGraft (and so that any updates don't overwrite your modification). Still another way is to make grab a square of the characters skin texture from the torso area and make a seamless pattern. Create a shader preset then apply to geografed items. It's not perfect but it's a start assuming you are going to go over it with the image processor of your choice. The first image is the original render out of Daz Studio 4.5 Pro. The second image is after I've done a little Photoshop magic on it. Note: I used the clone stamp at low opacity and a little healing brush here and there to blend out the edges between skin and geografed ares. I also added some transparency to the wing membrane areas. BTW, the original textures are actually a nice set. The original textured wing membranes render with semi-transparency and have some nice vein detail. Sure, rendering twice and cloning/masking works fine. It doesn't for animations though (granted, not many people are doing animations, but I'm starting to tinker with them), and most importantly, there's no way to know any of this until we actually buy the product. I've tried retexturing both the Popobawa wings and the Gorgon, and in the end, I think it's actually easier to do postwork in Photoshop (or use other products). Again, I think both products are well made and for anyone who doesn't need to customize them, they're certainly recommended. Several possible workarounds were listed on this thread but they all have their limits and issues. Time constraints, skill sets, available applications, animation, etc. can all be a factor. I did not intend to take away from the main point. I strongly agree it should be required for it to be listed clearly on the product page if it will not work with other genesis textures. I'd also like to know if it works really poorly with various shapes but that might be harder to clarify. Sure we can ask for a refund but it's still better to just communicate things clearer from the start. I also wish more products would at least separate the head morphs from the body morphs! That adds so much more possibilities and I would not think it's that much harder to produce? One thing that would help for geografted items like this is the inclusion of a white/grayscale version of the main diffuse texture so that one can more easily use the diffuse colour to try and match the grafts to the main figure's skin texture. The problem isn't the geografting itself. Convert it to a conforming item and you'd have the same issue - the item doesn't work with most textures. It's a problem with plenty of conforming creature addons as well. They either have hard edges or they need transparent sections to blend in. Neither is really ideal. It would be nice if geografted items came with a texture map carrying a little bit over onto the figure's skin that could easily be overlaid onto any character using the LIE or Poser material room. Then the item's actual textures could be more easily blended in. It's possible to do in an image editor if the geograft comes with a full character [and I personally would rather do that myself in many cases for control], but this would really help with ease of use. As far as I know, the key differences of geo-grafts are that they line up perfectly with the figure mesh with no overlap and they hide the mesh that they cover. Both methods have their advantages and either may be better to work with depending on the project and your skill sets. I think we would all like to see a best of both worlds if possible. Something along these lines might work. I also thought it might be easier to work with if the grafted part's UV mapping lined up with the figure as it gets close to the seams. If that's possible to pull off. The more work I have to do to get it how I want it, the less valuable it is. And sometimes it gets to the point I feel like I might be better off making the entire thing from scratch. More work overall but then you have the most control. However the strong point of DAZ content is that it saves time and make things more accessible. In any case they should make it clear on the product page how well it works with everything else. Indeed. For most body part changes like this, though, lining everything up perfectly and minimizing the mesh size is a good thing. No extra transparency equals no extra impact on render times, and since both DS and Poser have the ability to do texture overlays, that should be taken advantage of. Geografts haven't reached their full potential yet. I bet there will be some very impressive things to come. I considered that as well; it's almost a mirror of the idea. They'd probably both be useful in different situations, though it would be a little more difficult to get the UVs to match up with and carry over the removed skin, plus it would be more limiting in cases where the geograft only took over a small patch of the mesh. There wouldn't be much of the map to work with. And it would complicate the texturing, because if a geograft was mapped to take a certain part of the torso texture, that same part on the texture map would be unavailable for mapping the new geograft textures. The more work I have to do to get it to work how I want the less valuable it is. And sometimes it gets to the point I feel like I might be better off making the entire thing from scratch. More work overall but then you have the most control. However the strong point of DAZ content is that it saves time and make things more accessible. That would be nice. For a few geografted items there aren't really any shots of how it actually attaches to the body, which is something I'd prefer to see. I'd post some images of Popobawa grafts blended with another texture, and alphas for it if I can manage decent ones, but the order's still waiting on payment despite the eCheck having cleared. Freaking glitches. I'm sure it'll be sorted soon. The whole problem is that geografted items cannot be transmapped. If you use a transparency map on a geografted item, there will be nothing underneath, preventing users from blending the border between the geografted item and the figure. The bottom line is that if you intend to use a geografted item exactly as it was intended, with the included texture maps for both figure and geograft, you won't have any problem. If you don't - you're probably better off buying a conforming item. LIE (Layer Image Editor) presets could be used to add a layer on top of the skin to blend it in with the graft at the seams. Just like you can use LIE to add wounds, water or dirt over top of any skin. They would have to create one for each UV they want it compatible with though. I don't know anything about Poser but I assume they have an equivalent method. This exactly; there's no need to add extra geometry for transmaps anymore. Geografts are a much more elegant solution than the old conforming items, because now you know the texture will always line up the way you created it, no shifting the wrong way due to morphs, no sticking out past the base character or sinking beneath the surface, and no hurt to render times from an unnecessary transmap. I'll demonstrate once customer service sorts out the download if someone else hasn't beaten me to it. The fact is that very few people use LIE or even understand how it works. There are what, two PAs here who use it regularly in their products? Probably about the same number who use Shader Mixer presets in their products - just because the technology is there doesn't mean the community will make use of it. I would take a conformer that might poke through any day over a geografted item that I *cannot use* without massive postwork or LIE work because the technology doesn't allow me to mix and match it with other items well. Geografted items are indeed superior in many ways, but they're still only useful if they do what you need them to. Of course I'm interesting in seeing what you can do with LIE and hopefully it will not be too difficult for other people to make use of. Please share whatever you can, anything will be very helpful. I think the idea is to have the PAs do all the work in LIE. So all an end user should have to do is double click a LIE preset after applying their desired skin. Then it should instantly work on any skin with the UVs it was made for. The problem is they have not been setting them up for us like this. I only messed with LIE a little bit so far but I think this should be a fairly easy thing for most PAs to do. Sounds like easier to postwork the thing :) I always do that wit hthe Geocrafted stuff anyway because of the ever present edges between the parts. Here they are in use. Feeling a spurt of originality, I titled it: "Angels and Demons". I'm still learning Daz, so don't laugh too hard. I like them so far.